Area Fees are required upon booking the event and are non-refundable. If booking an evening party, the area is available to you and your guests until close. Most areas can support catered pre-ordered banquet food for your party. A server(s) will be assigned to your party area. Please refer to our party details listed on the bottom half of this page. 2nd Floor Booths located on second floor – which have NO sight lines to the stage – the u-shaped bench seating can seat 8-10 (8 is most comfortable) at $10/person with a minimum of $60, if less than 7 people. A small cocktail table works perfectly for appetizers and drinks. 18% gratuity for parties over 8 and 7% tax are additional. A server will take care of you and your guests’ beverage and food orders so you do not have to leave your party area to go to the bar. MENU: The Party & Special Events Menu is always recommended for any party over 15 guests. Banquet Menu selections are due at least two weeks from event date. A 50% food deposit is required once the menu selections are in place. Since the menu is priced per person, final guest count is needed four days before the event. If choosing not to pre order from our Banquet Menu, but order from our Dining Menu, orders are taken by your server when you arrive for your event/party. BAR: The bar can be set up either with a cash bar, open bar or a bar with a limit (either monetary or domestic, well liquor, house wine). 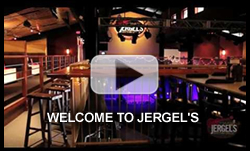 Jergel’s does not supply drink tickets, but you are more than welcome to bring in and pass out to your guests to control the amount of drinks you, as a host, would like to pay for. The servers run the drink orders from our main bar areas back to you and your guests. DECORATING: Balloons are fine for decorating. We ask that nothing be taped or affixed to our walls and no confetti or glitter–extra clean-up fees may apply. CAKE: You are more than welcome to bring in a cake (don’t forget your candles). We supply the china plates, napkins and utensils. Just let us know so we have a table set up for it. If you need to bring in the cake in ahead of time, we can make arrangements to do so. An ice cream cake is never recommended unless consumed immediately after placing out. MINORS: A minor can accompany a parent or legal guardian to a party. Please make our staff aware so they can be easily identified with a wrist band. Minors cannot approach the bar. Keep in mind that very young ears may need to arrive with ear plugs to protect them from the music volume. HANDICAP ACCESSIBLE: We have a ramp on the right front side of the building and an elevator to reach the second floor, if necessary. Our restrooms are located on the first and second floors and are handicap accessible, as well.